The Plantation, ca. 1825, courtesy of the Metropolitan Museum of Art. 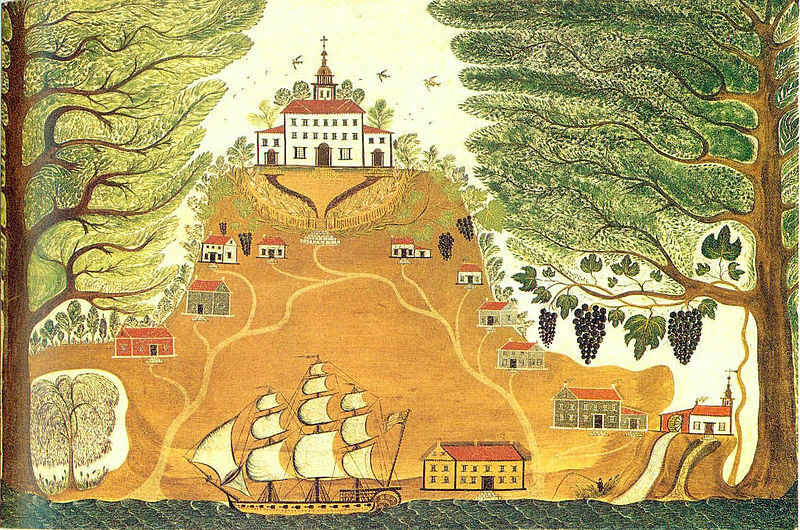 This painting by an unknown artist depicts fields for cultivating cash crops, a ship for exporting goods, and a large mansion, but enslaved laborers are notably absent from this representation of plantation life. The role of slavery in producing plantation wealth is often erased or romanticized in American popular culture, from during the time of slavery into the present. The conditions required for cultivating different cash crops largely shaped regional labor experiences and population demographics for enslaved Africans in the New World. European settlers experimented with a range of crops and export goods, often with significant influences from American Indians and Africans, but eventually market competition and environmental constraints determined which major cash crop different plantation regions primarily exported. The most lucrative cash crops to emerge from the Americas in the seventeenth and eighteenth centuries were sugar, tobacco, and rice. Cotton agriculture did not become a major feature of the U.S. southern economy until the early nineteenth century. 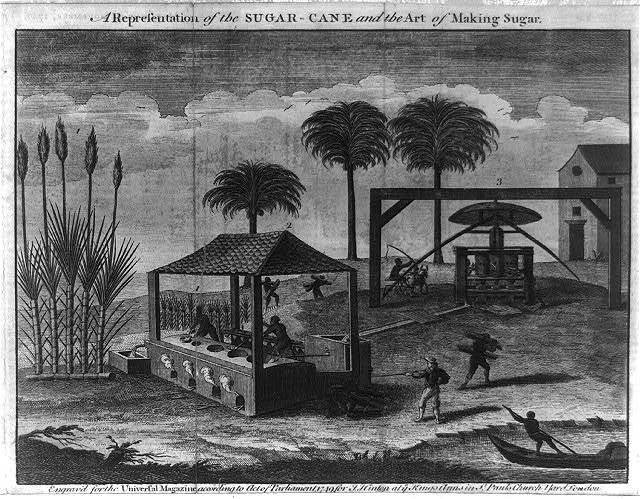 A representation of the sugar-cane and the art of making sugar, West Indies, engraved by John Hinton, 1749, courtesy of the Library of Congress. Slave market in Pernambuco, Brazil, drawing by Augs. Earle, engraving by Francis Edward Finden, 1824, courtesy of the Library of Congress. 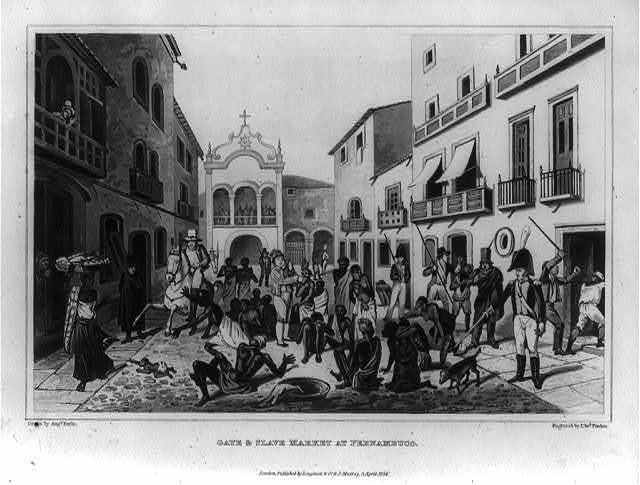 Slave market in Pernambuco, Brazil, drawing by Augs. Earle, engraving by Francis Edward Finden, 1824, courtesy of the Library of Congress. The engraving was included in the journal of Maria Graham’s voyage to Brazil from 1821-23. The lucrative potential of sugar launched the rise of plantation agriculture from the Middle East to the Mediterranean, to islands in the Indian and Atlantic Oceans near Africa, and finally to the Americas. By the mid-seventeenth century, European settlers in the Caribbean and Brazil had established sugar plantation systems that dominated the trans-Atlantic sugar market. Sugarcane agriculture required a large labor force and strenuous physical labor (particularly during harvest times) to cultivate a profitable export. It also required skilled laborers for processing the crop from cane, to juice, and finally to crystallized sugar, molasses, or alcohol. Sugar planters in the Americas initially deployed the labor of enslaved American Indians as well as enslaved Africans and European indentured servants, but by the late seventeenth and eighteenth centuries, African slavery had become the dominant plantation labor system. European diseases often decimated indigenous populations, and planters found it increasingly difficult to coax indentured servants to work under the brutal conditions of sugar production. Increased European access to the trans-Atlantic slave trade in the seventeenth century made enslaved Africans more cost-effective than indentured servants, and the growing wealth of sugar planters meant they could increasingly afford to invest in enslaved Africans for large plantation operations. Planters could also purchase enslaved Africans on credit, and then use the proceeds of their labor to pay the cost. Sugar cultivation primarily thrived in the tropical regions of the Caribbean and Brazil (and later Louisiana in the nineteenth century). Diseases such as smallpox, typhoid, and dysentery were prevalent in the tropical climate, and enslaved workers were exceptionally vulnerable due to extreme labor exertion, malnutrition, and the recent trauma of the Middle Passage. For these reasons, mortality rates for enslaved workers were generally high in many sugar-producing areas, and often exceeded survival rates. Significant demand for new African laborers through the trans-Atlantic slave trade often remained consistent in these areas into the early nineteenth century. 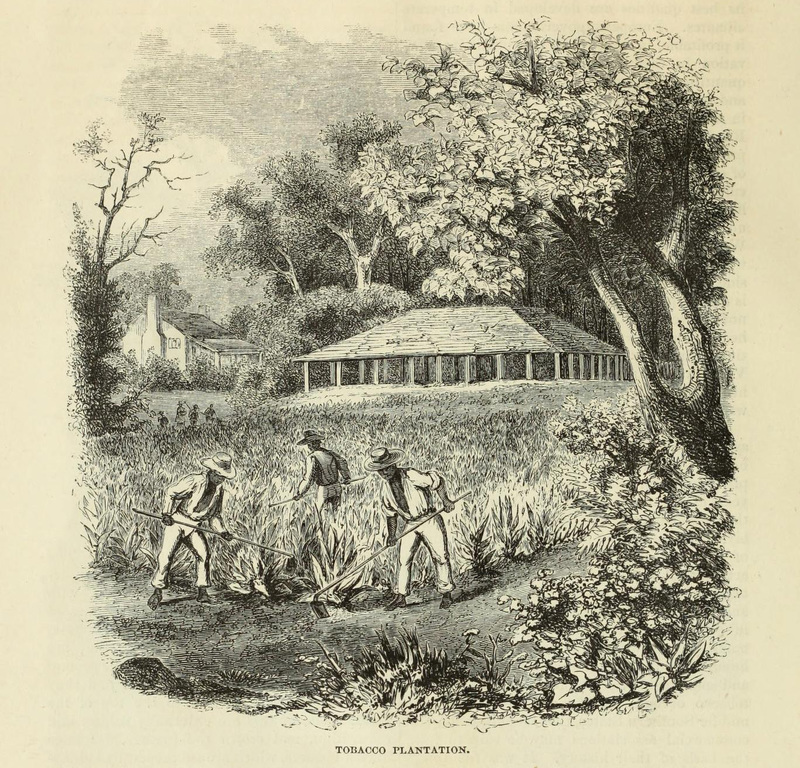 Tobacco Plantation, engraving from Harpers' Weekly, 1855, courtesy of the Internet Archive. 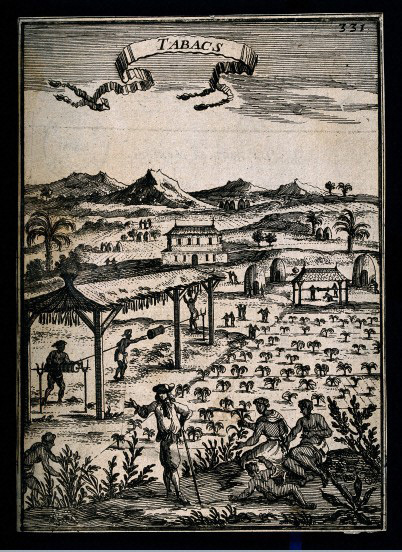 A tobacco plantation with black workers and a white overseer, engraving, circa late 17th century, courtesy of the Wellcome Collection, London. Tobacco plantations thrived in the temperate climate of the Mid-Atlantic region of North America starting with the English colony of Virginia in the seventeenth century. In contrast to sugar, European settlers could make a profit growing tobacco with smaller slaveholdings and less labor exertion. The result was that mortality rates were less extreme than sugar plantation areas, though they remained significant, particularly during the early development of tobacco plantation production. In contrast to sugar plantations, which required large slaveholdings that often led to a black population majority, tobacco plantations could operate profitably with smaller numbers of slaves. They also employed a mixed labor force of free, indentured, and enslaved workers, so that colonial tobacco plantation regions often had a white population majority. In this minority context, enslaved Africans and African Americans had less access to the extended kinship connections found with large enslaved communities in black majority contexts. They maintained African community enclaves, but enslaved Africans in the Mid-Atlantic tobacco region in North America also lived in close and constant proximity to local whites. This proximity could have violent consequences for enslaved Africans and their African American descendants. Slaveholders throughout the New World regularly sought to break new arrivals into submission by stripping them of their African identities. Along with limiting independence and mobility, slaveholders employed oppressive strategies that included removing African names, assigning physically demanding labor, and minimizing food and clothing rations. Further submission methods were developed over time, such as legally forbidding African spiritual practices, drumming, and speaking in African languages. In black majority contexts, these oppressive strategies were also used, but could be more difficult to continuously implement, because slaveholders had less direct interaction with individuals from large groups of enslaved laborers. In white majority contexts, or in colonies that functioned as societies with slaves, slaveholders often had more direct and regular opportunities to control the daily experiences of enslaved people. 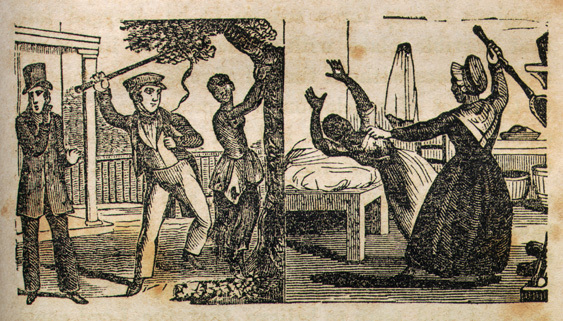 Images of punishment under slavery, from Narrative of the Life and Adventures of Henry Bibb, an American Slave, Written by Himself, 1849, courtesy of Documenting the American South at the University of North Carolina.